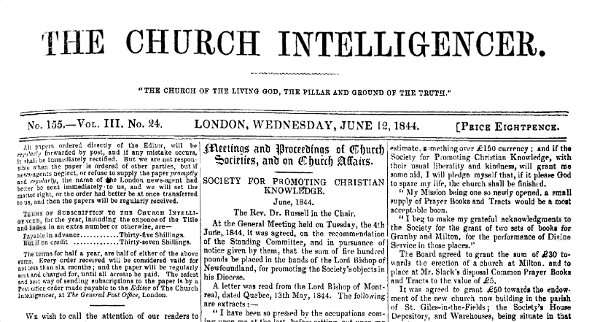 ‘The Church Intelligencer’ was a weekly magazine, first published in London in 1841. In this issue, page 2 is numbered 554 and this article is printed on pages 12-13, numbered 564-565. With a new layout, it was republished in April 1884 as a monthly magazine. We have great pleasure in fulfilling the promise which we made to our readers last week of supplying a report of the proceedings connected with the “holiday” and fete at this interesting old village on the 23rd. Before we do a few brief notices on the date and architectural pretensions of the church and its massive tower may not be unacceptable. The sacred edifice is dedicated to the Holy Trinity and from the earliest times the inhabitants of Bosbury have been accustomed to attend the church services on Trinity Sunday in great numbers, and to reserve the week following for a general merrymaking; thus avoiding the too frequent desecrations consequent upon Sunday-wakes, and the excesses which have so often been visited with the severe but merited reprehension of learned judges on this circuit. This ancient village has still many curious relics of gone ages remaining amongst its “auld stanes” indeed the most unimaginative traveller will be agreeably surprised at the lengthened vista of antique gables and grotesque frontage which meets his eye on crossing the bridge at the entrance of the village. Some of the ancient folk are not a little proud of the “former glories” of the place and quote (with perhaps a pardonable complacency) the old distich – “Bosburie was a towne ere Hereforde was a citie.” The vestiges of olden times which are to be found in every part of the parish, seem in a great measure to justify the pretensions of the inhabitants. In the old farm house (called the “Old Court”) and buildings, closely contiguous to the church-yard, are to be seen remains of the Palace of former Bishops of Hereford; the principal entrance and wicket-postern to the palace-yard are still remaining and the prison also in which, in the palmy days of Romish prelacy, offenders against the provisions of Leet-courts and Church-laws were incarcerated. A curious specimen of the embossed ceiling is still extant in the older part of the dwelling-house. On the extreme south side of the village an ancient building with a very handsome apartment 25 feet square, panelled to the ceiling with old oak of a very rich grain, whilst the ceiling is supported with rafters of the same, the points at which they intersect each other being ornamented with bosses, containing the arms of Bishop Skipp (1552), of the house of Scrope and of William Paulet, Marquis of Winchester, Marquis of Knight of the Garter in the 35th year of Henry VIII. On the fourth boss the arms have been obliterated – it should seem designedly, since the corresponding shield over the mantel-piece has been defaced in a similar manner, whilst the other three shields remain uninjured, and correspond with their respective bosses as above mentioned. These arms are also emblazoned on two very fine monuments in the chancel, to the memory of the Harfords, connected with the ancient family of the Brydges, of this county, now represented by the respected owner of Tibberton Court. A mural tablet to Michael Hopton, of Canon Froome Court (who died in 1601), and who married Martha Harford; together with a portrait of a Marquis of Winchester, now to be seen at Canon Froome (probably of the same Marquis whose heraldic-shield has been already noticed), supply us with data by which to trace the intermarriages of these three families in the 16th century. This parish is further celebrated as being a former station of the Knights Templars; a distinction which it shares with only one other parish in this country. Temple Court is still one of the chief houses in the place, and the old moat round the homestead and garden is yet perfect. Many of the more aged people recollect a rude pile of moss-grown stones, the last reliques of the Chauntry, erected by those stalwart and Militant Ecclesiatics. and to summon them to the interesting business of the day for which the most efficient preparations had been made by the authorities of the parish. The approach to the village from the Worcester-road presented a very pleasing and animated scene. On the left side, in front of the principal inn, “mine host” (a true follower of Lord John Manners) had erected a gay may-pole, quite of the olden time, handsomely decorated and festooned; on the right the old gable of the school-house (erected by Sir Rowland Morton in the reign of Henry VII.) was hung with draperies with suitable mottoes on them. From the church tower, which has every appearance of extreme antiquity, and suggests the idea of a massive fortalice of a very rude age, floated the meteor flag of England, with smaller pennons on the east and west turrets; whilst the litchett and southern porch of the church were surmounted by branches of British oak interlaced with festoons of flowers. We were much interested by the successful way in which the characteristic and dilapidated relics of this ancient church had been restored. The litchett seemed to be in substantial repair; the fine cross which intercepted in former times the entrance to the church had been re-set upon a rough pedestal (of stone, instead of the crazy-brick foundation which once encumbered it), without any displacement of the mosses and lichens adhering to it. Within the sacred edifice an ancient Letturne (or Lecturne) occupied the centre Nave of the Church, such as may still be seen in some of our cathedrals and colleges. The font, coeval with the Church, had been judiciously restored, fresh pillars supplied, and the whole raised on a broad pedestal at the west-end in front of the organ loft. Our antiquarian readers must forthwith commence a pilgrimage to see this fine specimen of design of the 11th century. In removing the font from its former faulty position, the workmen discovered (two feet below the surface) another font of the rudest description, turned upside-down to form a base to the one now in use. We have no suggestion to offer upon the date of this time-honoured monument except its massiveness and simplicity favour the idea that it was the original font used in the church erected here in the eighth or ninth century; or perhaps we might assign it a still earlier period. The entire west end of the church, in which forty years ago a vestry-closet, small gallery and receptacle for coal were intruded, has been reopened; four beautiful lanceolet windows, which had been closed by chimney-flues or doors, have been replaced; the fine columns and arches which support the nave and aisles have been thoroughly cleansed from the incrustation of lime and ochre which disfigured them; the oak compartments freed from filth and dirt, and the beautiful grain of the wood brought out into due prominence. The old unenclosed sittings of solid dark oak (with mural tops cleansed and varnished), harmonize beautifully with the stone columns, whose solidity is however softened by the rich natural tint of the stone of which they are constructed. The west [east?] end of the church is now occupied by a handsome gothic elevation, the front screen of which is worked into five compartments or stalls for the singers; above these a beautiful organ (by Bates) has been erected. The effect produced by these various renovations is very striking, and reminds the visitor of the rich and solemn beauties of our cathedrals and abbey churches. At half-past ten the village began to be thronged with carriages and vehicles of every description, conveying neighbours and friends from Ledbury and the adjacent parishes. At eleven o’clock a procession was formed at the Vicarage; the architect, Mr. Jukes, preceded the churchwardens and a portion of the Committee, who were followed by the Rev. the Dean of St. Asaph, and the Rev. J. Hopton (who officiated at the altar), the Rev. Vicar of the parish, and Rev. W. Dyke (who occupied the reading-desk and lecturn), and the Rev. J. Sill, and Rev. W. Evans, of Barton Court (Prebendary of our Cathedral), who assisted at the collection during the Offertory. The latter gentleman preached a suitable discourse on the occasion, and reminded his numerous and attentive auditors of the necessity of making the Church what it assumed to be, “the poor man’s Church.” The Rev. gentleman drew an eloquent and touching picture of the wants and privations of the “labouring poor;” he paid a just and affecting tribute to their endurance resignation, and mutual attachment; and taking up his parable from a consideration of the “Unity which is betwixt Christ and his Church,” made references full of truth and pathos to the bonds of Union which adorn the peasant’s home. He concluded his eloquent address by an appeal to the Christian sympathies of the congregation and admonished them to mitigate as far as in them lay the inequalities of their condition by supplying the poor with Church accommodation in no way inferior to that enjoyed by the privileged classes of the community. At the Offertory nearly £65 were collected in aid of the funds to meet the costs of the alterations in the Church. Mr. Woodward, organist of Ledbury, presided at the new organ and elicited the full tone and sweetness of the instrument in “The Heavens are Telling” and “The Hallelujah Chorus.” The singing was solemn and effective; the old 100th.sung by the full choir pealed grandly through the arches of the venerable pile. We cannot too much commend the “decency and order” which marked the routine of the Church services, and the becoming attention to minutiae which (though to higher aims are not to be neglected without manifest disadvantage. The committee, consisting of the most influential gentlemen in the parish, distinguished by their white rosettes, the churchwardens with their wands of office, and the parochial constabulary with their apple-green favours and staves, all helped to give a certain decorous animation to the scene. The collection was received by T. Spencer, Esq., banker, of Ledbury, the parish treasurer, to be carried to the account of the Committee. Note: The five lines in Latin are a quotation from Virgil, the first book of The Georgics. This translation is by J. W. MacKail from 1934. The original article appeared in both the Hereford Journal of Wednesday, 29th May, 1844 and the Hereford Times of Saturday, 1st June, 1844.